We have recently completed a first-floor extension in Galston where we used Hebel panels for the cladding material. The requirement was to match the existing rendered brick home. The Hebel was chosen after considerable discussion about what choice to make for the cladding. Here is a bit more information about the cladding choices you have when you build a new home or do a renovation or extension. ‘Cladding’ is the term we use to describe the material that forms outside of the exterior walls. You may or may not be aware that in most cases the cladding is merely there for insulation and visual appeal. For example, when you see a brick house, in most cases the bricks aren’t holding anything up. The house is held up by the frames and the bricks are merely laid to create an external envelope and insulate the home. You have many choices for cladding and each have their own characteristics and, of course, their own price tag. The Hebel we used at above job is a form of Aerated Concrete. Aerated concrete comes in blocks and also in panels. It is easy to work with as it can be easily cut and is light to carry around. It’s light weight also makes it ideal for using in first story applications like this one as it can often avoid the need for ‘underpinning’ where we need to strengthen the footings or structural steel of the original house before we add the additional weight of a first-floor addition. Aerated concrete can be easily rendered and painted to match the existing cladding of the home and is also relatively cheap and freely available in most areas. Aerated concrete has excellent insulation characteristics. It is available in 100mm or 200mm thicknesses. The 100mm is very warm and the 200mm is about the best insulation that is available. Traditional bricks come in a limitless range of colours and finishes to suit all tastes. Bricks can obviously also be rendered if desired. Bricks are more expensive to build with because, so far, there is no quicker way to lay them than one at a time by hand. Bricks are also harder to match down the track as each ‘batch’ is largely unique depending on the clay mixture used to create them. We recommend you store 100 or so spare bricks under your house if you have them left over at the end of your addition or extension project as you never know when you might need them. Bricks are most commonly used as a ‘veneer’ around homes with insulation installed inside them within the frames of the building. You can also build a new home in ‘full brick’ which involves a double layer of bricks around the external walls of the home and a single layer brick wall for internal walls downstairs (usually deemed to heavy for first floor internal walls). Bricks have sound insulation characteristics. 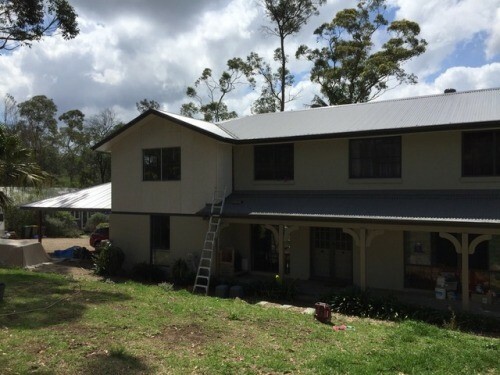 Fibre cement cladding is a common traditional method of cladding in Australia. It used to be used in sheets but most often these days it is in weatherboard strips. Finished and painted nicely (including filling under each board) it looks sensational and is very warm and robust. Particularly nice on traditional houses but also nice on the first floor of brick or rendered homes. Then of course there is the old mud brick. It looks great but is not actually as warm as its reputation suggests. Mud bricks also require a bit more care. Render must be maintained at all times and any little leaks above the bricks will lead to them falling apart before your eyes. Straw bales are also popular these days. I don’t know much about straw bale houses to be honest. My observation is that building with straw bales is a romantic idea that often leads to slow build times with difficulties sourcing the bales and the skills required. If you would like to build a straw bale house I’m probably not your guy, but I’ll happily come around for a beer and have a look through it when you’re finished! Please see below a little bit of a list of the R-values of the various claddings. An R-value is a measure of how well an object, per unit of its exposed area, resists conductive flow of heat: the greater the R-value, the greater the resistance and the better it is at insulating. As you can see, the aerated blocks are the clear winner. I hope that’s a bit of helpful information for you. Please don’t hesitate to contact us if you would like to discuss any of the above for a prospective new home build, renovation or extension.